(FYI: If you haven’t already, read the post on Australia’s Stolen Generations for more background to this story). It was 2008, and thousands of Aboriginal Australians gathered in the Australian capital city of Canberra. Across the country, many more thousands of people gathered in plazas and remote towns, where screens had been set up to show a televised address. It was a crucial day in Australia’s history, and people wanted to be a part of it. That morning, at 9:30 am, Prime Minister Kevin Rudd delivered the Stolen Generations apology as a motion to be voted on by Parliament. That was 5 years ago today (for my US readers), and while many people rightly point out that an apology doesn’t come close to fixing the wrongs done against native people, most also agree it’s the only way to start a process of reconciliation. I’m amazed at the power of the word “sorry” here in Australia – a word I often think of as empty or insincere. It was first used seriously toward indigenous Australians on May 26 1998, when the “Bringing Them Home” report – a lengthy documentation of the “Stolen Generations” – was tabled in Parliament. 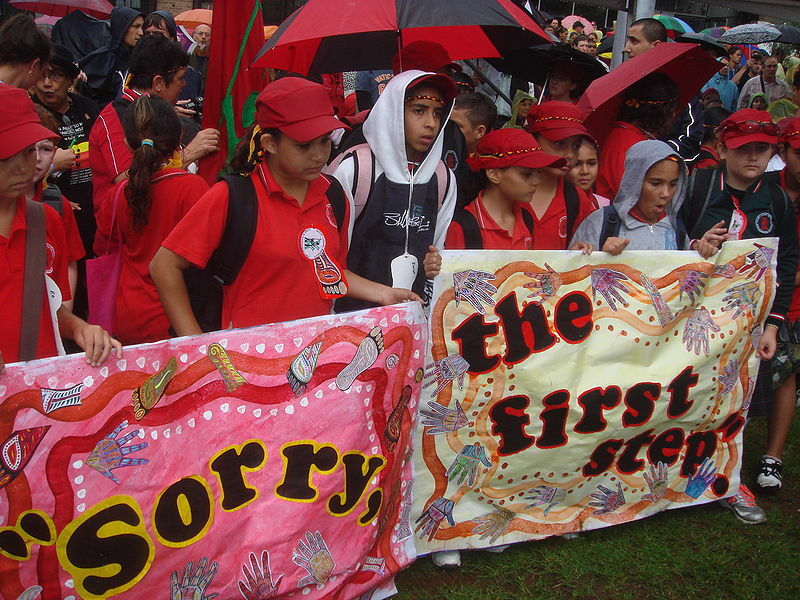 After that, May 26 became known as “National Sorry Day” – a day meant to raise awareness for the plight of indigenous Australians. Then came Rudd’s formal apology ten years later, which was written in consultation with indigenous elders. After his address, “Sorry” was written on t-shirts, posted on signs, and used as a rallying cry. It makes sense that hearing “sorry” from a lawmaking body would be moving: it’s done so rarely. Politicians love to claim the good part of their predecessors’ legacies in order to puff up their own greatness; but if they claim the good, then why not also acknowledge the bad? I’m very happy Australia is grappling with its terrible history. So many other countries, including my own, have suffered more than they needed to by sweeping collective memory under the rug. Of course without action, “sorry” is empty and insincere. But even though it’s hard to follow up on, and even when it digs deep into the past, it’s still always worth saying. Thanks for highlighting this, Joanna. I just learned about Australia’s history with this a few days ago in one of my seminars. I was shocked to hear that this also happened to indigenous peoples in outside of the United States. I’m really sad to have to use the word “also.” My grandparents were taken away to boarding schools, and I’m personally sorting through what that means for my family’s history these days. That’s incredible, Leah. I had no idea, so thanks for sharing. I’m glad the timing was fitting for you. A side note: my Art & Ethnography class watched BabaKiueria (http://www.youtube.com/watch?v=SHK308_MTiU). I found it hilarious but poignant about these issues in Australia.